In the year 2005, after an abortive attack on Autobot City, the evil Decepticons found it necessary to jettison excess mass from their craft to make it back to their homeworld of Cybertron. The injured and dying Decepticons, including the Decepticons' leader, Megatron, were chosen to be ejected into the void of space. When their bodies were recovered by the world-eater, Unicron, they were reborn as deadly new warriors in the service of the recreated Megatron, now known as Galvatron. 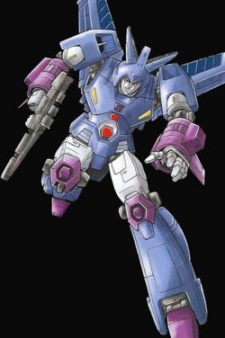 Although The Transformers: The Movie does not make it entirely clear who Cyclonus was in his previous incarnation, he is one of the new Decepticons created by Unicron using the body of either Skywarp or Bombshell. He is a being whose loyalty to Galvatron is so intense as to exclude most other emotions and interests from his mind. Dedicated to destruction in his leader’s name, Cyclonus transforms into a nuclear-powered multi-turbine-engine jet fighter, capable of space flight and able to expand in size to convey Galvatron. In robot mode, he wields an oxidating laser that fuses the internal mechanisms of its targets, and in vehicle mode is additionally armed with an incendiary bomb rack. Immediately following his creation, Cyclonus served as little more than Galvatron’s personal ship, carrying his leader to Starscream’s coronation, into the battle in Autobot City, and pursuing Autobots on the Planet of Junk, as well as attacking and crippling the shuttle carrying Hot Rod and Kup in the midst of it all. After the destruction of Unicron, however, when Galvatron was lost, Cyclonus came into his own, his loyalty to the Decepticons' absent leader shaping his character in different ways. Disgusted with how far the leaderless Decepticons had fallen as they eked out a miserable existence on the barren world of Chaar, Cyclonus resolved to locate Galvatron, daring even to enter Unicron's deactivated, disembodied head and replaying its memory banks, tracing Galvatron to the world of Thrull. Unfortunately, once extricated from a pool of the planet's plasma-lava, Galvatron proved to have been driven insane from exposure to it and brutalized Cyclonus and Sweeps before being talked down and returned to his position as leader.